The Youth practice on Monday is cancelled due to the kids not being in school. Also, the Youth Practice on Wednesday is changing to 5:30-6:30pm ALL LIVE. The first whistle will blow at 5:30pm so please don’t be late. This is so we can all go watch the HS team in their Team Section Tournament at the High School. The HS team will first wrestle Hampton at 6pm, and then if they win, around 7:15pm they will wrestle the winner of NA/Butler for the Section Championship. The team is calling for a BLUE OUT for this and throughout the playoffs. HS Results: The SV Varsity team beat Pine Richland Wednesday night 59-13. JH Results: The Junior High team beat Pine Richland Wednesday night 80-15. The 2-Day JH Tournament at Bellefonte was not attended due to the AD cancelling us out due to the forecasted weather. Tournament results can still be found on FloWrestling. Expect another tournament or additional dual matches to be added to the schedule to meet the PIAA match points allowed for the season. More will come when a decision is made. Youth Results: The League Match at Central Valley was cancelled due to forecasted weather. The 7pm HS Varsity Match on Wednesday against Pine Richland is Raider Senior/Youth Night. All Youth Wrestlers are encouraged to attend. We will not have youth practice that night. If the youth wear their SV Wrestling t-shirt, they will get into the match free. We will also have 3 youth matches interspersed throughout the Varsity Match. Those youth wrestlers will be Jackson Habel, Gabe Johnson, and Mimi Skowronski. HS Results: The SV Varsity team beat Mars Wednesday night 65-9. Saturday the High School team participated in duals at Reynolds. SV defeated Saint Vincent Saint Mary’s (OH) 51-27 and Erie McDowell 53-21. They then took on PA AA #1 ranked Reynolds and lost 39-25. JH Results: The Junior High team beat Mars Wednesday night 99-6. Youth Results: The youth competed in their first WAWA League match and the coaches were very impressed with how they did. Keep up the great work! Thank you to everyone who helped set up, break down, and work at the WAWA League Youth Duals Sunday! This was a whole team effort and could not take place without everyone’s help and support. Thank you!!! HS Results: The SV Varsity team beat Knoch Wednesday night 72-6. JH Results: The Junior High team beat Knoch Wednesday night 92-3. Youth Results: The SV Youth Wrestling team was in action at the WAWA League Duals on Sunday going 3-1 and taking 3rd place. In pool play, they beat Hopewell 62-27 and Beaver 62-33 before falling to the eventual champion Quaker Valley 55-30 who beat West A in the championship match 70-15. In the 3rd place match, SV beat Central Valley 49-37. Great job Raiders! HS Results: The Raider Varsity Team competed at the Powerade Wrestling Tournament this weekend which is touted as one of the toughest HS tournaments in the nation, only 2nd to Ironman which the team competed at earlier in the month. The team finished in 8th place out of 52 teams behind national powerhouses St. Ed’s (OH), Oak Park River Forest (IL), Parkersburg South (WV), and western powerhouses Kiski, Hempfield, Reynolds, and Erie Cathedral Prep. Placing for SV were Nick Montalbano (8th), Dylan Chappell (2nd)(losing a tight finals match to the #8 nationally ranked kid from Reynolds), and Alejandro Herrera-Rondon (1st). Alejandro was also named the tournament Outstanding Wrestler after beating in the finals the #2 ranked Flowrestling wrestler in the nation who is also a 2x Cadet world champion. On Thursday, the HS JV team competed in the Powerade JV tournament bringing home 3 medals: Timmy Johnson (3rd). Hunter Swedish (2nd), Caden Leighty (1st). JH Results: Did not compete over winter break. We have practice Dec 31st 9-11am. Wrestle-offs for future matches will be held Thurs Jan 3rd. Youth Results: We had youth wrestlers all over the state wrestling this week. High School Results: Our #8th ranked HS Team wrestled Butler on Wednesday and walked away with a win. They then wrestled 2 of the top 10 teams in PA on Friday night at Canon-Mac finishing 1-1. This was a showdown of what will probably be the final 4 teams left in the WPIAL Team Dual Tournament coming up in about month for a trip to Team States. The first match SV wrestled #3 Kiski and lost 39-32. The following match against #10 Hempfield ended with a 34-33 win. Both duals came down to the very last match. Other results from that set of duals was #10 Hempfield 42 over #9 Canon-Mac 24 and #3 Kiski 36 over #9 Canon-Mac 33. Junior High Results: The Junior High Team took on Butler on Wednesday night walking away with a 67-30 win. The Junior High Team will practice over break Dec 26-Dec 29 9am-10:30am and Dec 31 9am-11am. If a wrestler is changing weight classes after break, he/she needs to have his/her weight within a pound for the Knoch Match to wrestle-off at the new weight the next day. NA Young Guns Novice: Dom Mignanelli (1st), Jackson Habel (2nd), Cam Grupp (2nd), Kaden Kyes (2nd), Sebastian Rothrock (3rd), Grey Rothrock (3rd), and Abram Knezovich (4th). 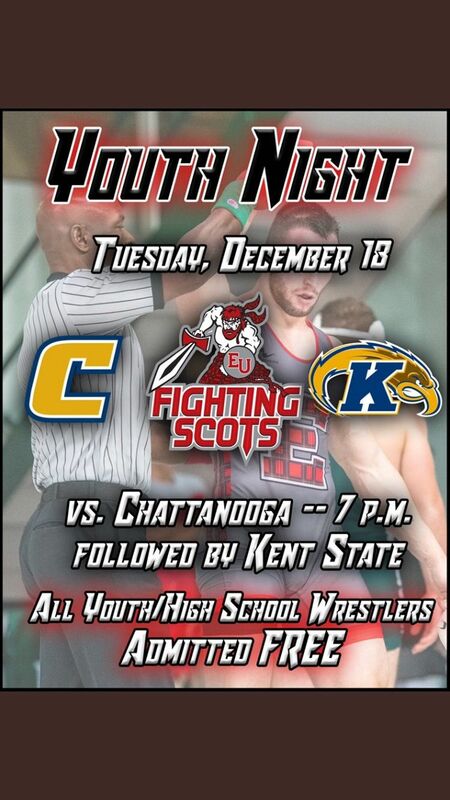 Edinboro is hosting a Youth Night on Tuesday Dec 18thand we are all invited. Edinboro's Coach Matt Hill is the uncle of one of our youth wrestlers, Zach Hill. Edinboro takes on Chatanooga and Kent State at 7pm. HS Results: The High School Varsity Team competed at the very tough King of the Mountain Tournament bringing home their highest team finish and most placers ever. The SV team finished in 2nd place with 9 place winners: Dylan Chappell (1st), Alejandro Herrera-Rondon (1st), Drew Vlasnik (2nd), Nick Montalbano (2nd), Jason Geyer (3rd), Chanz Shearer (6th), Hunter Swedish (7th), Antonio Amelio (7th), and Davin Beahm (7th). The HS JV Team was also in action this weekend at the Butler JV Tournament. Placing for SV was Caden Leighty (2nd). JH Results: The Junior High Wrestling Team was in action at the 28 team South Fayette Tournament also bringing home their highest team finish and most placers. 28 wrestlers competed for the Raiders with 13 of them earning some hardware on the medal stand. The SV team finished in 2nd place overall, only 5 points behind the champion Connellsville. This was a full team effort to finish so well. Place winners included Connor Smith (1st), Marshall Adamson (1st), Tyler Yurich (1st), Max Jackman (2nd), Tyler Chappell (3rd), Evan Vetter (3rd), Aiden Leiendecker (4th), Aidan Hayes (5th), Caden Matthews (5th) Alex Paulson (5th), Mark Gartner (6th), Logan Armstrong (6th), and Andrew Musser (6th). Youth Results: The Youth Wrestling Team took a small team to the Tool City Elementary Duals on Saturday and finished in 3rd place, going 4-2 for the day. They beat teams from Oil City, Trinity, Hickory, and DuBois. The 2 losses were to North Allegheny, both so close that they came down to the final match (one losing by 2 pts and the other tied going into that match). The kids wrestled their hearts out and made us all proud. Other youth action included earning some hardware at the Hampton Novice Tournament: Mason Purvis (1st), Jackson Habel (1st), and Cam Grupp (2nd), and the Moon 1st Year Tournament: Landon Hartzell (1st), Greg Grupp (3rd), and Nolan Grupp (3rd). HS Results: The SV Varsity team was in action this weekend at the TOUGHEST regular season HS tournament in the nation, Walsh Jesuit Ironman. The team wrestled great with just about every wrestler adding a win to the team score. The Raiders finished in 30th as a team out of 89 teams (behind 4 PA Teams: Wyoming Seminary, Bethlehem Catholic, Notre Dame, and Reynolds) that sent wrestlers to compete. Notable performances were by Jason Geyer who went 2-2 and Dylan Chappell who lost in the quarterfinals and in the blood round going 2-2. The team was led by an outstanding performance by Alejandro Herrera-Rondon who topped the #2 kid in the nation in the Quarterfinals enroute to a 2nd place finish, losing 2-1 in the Finals to the #1 kid in the nation from California. The HS is next in action at home Wednesday against Armstrong and then Friday and Saturday at the King of the Mountain tournament. JH Results: The Junior High team went 4-1 this weekend at the Seneca Valley Duals. Their wins were over South Fayette 87-10, Ft. Lebouef 70-18, Kiski 61-39, and Hempfield 60-40. Their lone loss came from Canon-Mac 32-51. Going 5-0 on the day for the Raiders were Connor Smith (75#), Tyler Chappell (85#), Evan Vetter (115#), Aiden Hayes (138#), and Marshall Adamson (145#). The JH is next in action at home Wednesday against Armstrong and then Friday and Saturday at the South Fayette Tournament. The Wrestling season has begun!!! We had several youth wrestlers in action this weekend, results below. If I missed anyone, please let me know so I can add them in. We also have the High School and Junior High Seasons beginning this week with some exciting action! High School - The Seneca Valley High School team will be competing in the toughest regular season HS wrestling tournament in the nation Friday and Saturday Dec 7-8 at the Walsh Jesuit Ironman Wrestling Tournament at Walsh Jesuit HS in Cuyahoga Falls, Ohio. There are over 100 nationally ranked wrestlers competing from 21 states: Ohio, Pennsylvania, New Jersey, Oklahoma, Missouri, Utah, California, Virginia, Hawaii, Florida, Illinois, Colorado, Maryland, West Virginia, Texas, Oregon, Delaware, New York, North Carolina, Nebraska, and Kentucky. 13 of the top 20 teams (27 of the top 50) in the nation, according to the USAToday National Pre-Season Rankings, will be competing. Only the best wrestlers in the nation survive this tournament by standing on the podium in the top 8 at the end. Many individuals are invited to compete in this tournament, but to be invited as a complete team is a huge honor in itself. You should be able to follow along at http://walshjesuitironman.com/ (the 2018 Program is there) with wrestling beginning Friday at 10am and the Championship matches on Saturday at 3:45pm. I believe it will also be aired on flowrestling.org. If you want to see some AWESOME live wrestling, I highly recommend taking a few hours to go watch. I know many college recruiters sit in the stands watching this tournament. Good Luck Raiders! Prove to everyone that we belong by competing hard and bringing home some hardware! Junior High School - The Seneca Valley Junior High Team will be hosting some of the top Middle School Wrestling teams in Western PA at the Seneca Valley Duals on Saturday Dec 8th at the SV Middle School. The SV team will get 5 dual matches throughout the day. Teams attending will be Seneca Valley, Kiski, Fort LeBouef, Hempfield, Quaker Valley, Burrell, Canon-Mac, and South Fayette. Wrestling begins promptly at 9:30am. If you are in the area and want to see some good wrestling with a team dual atmosphere, come support the team. Youth - Registration for the following tournaments can be found at www.pywrestling.com. I will also put what the oldest age group is since some of these will be available for Junior High Wrestlers too. Good Luck to all Raiders Wrestlers this weekend!!! Do us all proud! You can set up your own account upon registering your wrestler for the season. Simply click on the orange "Register Now" button to begin the registration process. When you are finished with registration, you will simply visit the site, click "Sign In" on the top right corner, fill in the email address you used during registration, and hit "Forgot Password". The system will walk you through setting up a password of your choice. If you are not registering a wrestler, are new to this SV Wrestling site, and feel you need an account, please send an email to Melissa Smith at smith_melissa@bah.com from the email you want your account set to. In the Subject line, simply say "Account Setup". You should receive an email within 1-3 days announcing your account has been set up and providing instructions for creating your password. You will need an account to volunteer for events in the system, check the status of payments made, and other administrative items.